While doing some research this past week, I happened upon this lovely lady and thought you might enjoy her as much as I. 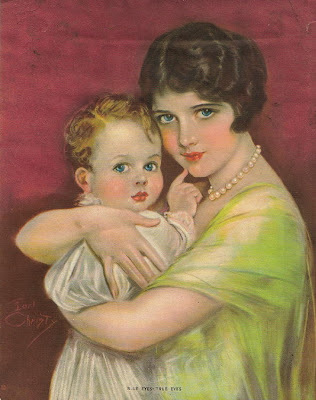 This portrait (in the public domain) is so evocative of another time. I love her coy, "come hither" look that's full of promises. If I close my eyes I can almost smell her fragrant perfume and hear the tinkle of champagne glasses. Just look at the way the light falls on her dreamy satin gown! So romantic! Wishing you a weekend filled with romance! Round up the children and put on your "Sunday Best"! The "Red Cloud Flying Pig Revue" is in town! The the show features sassy dancing girls, live music; and, the premier act for your entertainment pleasure is . . . (of course) . 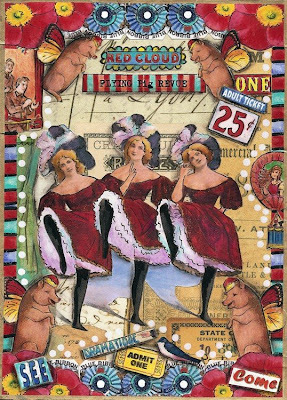 . . the world renowned Red Cloud flying pigs! This week's Crowabout challenge was a lot of fun. When I saw the collage sheet, I fell in love with the image of the little porker wearing a crown. 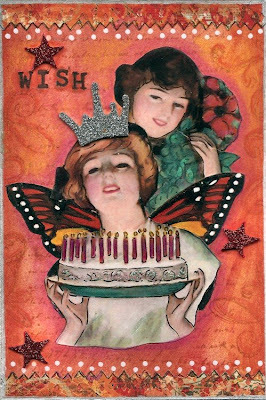 And, since a colorful butterfly was included on the sheet too, it was a no-brainer for me . . . I just had to do a flying pig. And, when it comes to flying pigs, the more the merrier as far as I'm concerned! Approximately nine of this week's given images were used in this production. 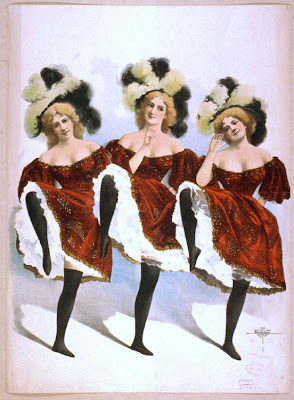 The sassy dancers are from the Library of Congress, and most of the remaining images were taken from past Crowabout challenge sheets. Photo editing was used for sizing only. All of the images were printed out, hand cut and glued to a piece of scrapbook paper dry mounted to a piece of recycled chipboard. Enhanced coloring was done with watercolor pencils, Prismacolor pencils and pan pastels. Pitt pens were used for "drawing", and the entire piece was edged with a copper-colored marking pen. Awfully cute and awfully social! Someone just received her report card and has a few academic improvements to make! Miss "Social Butterfly" was caught passing notes and whispering in class! The theme for this Sunday Postcard Art's challenge was "numbers". So, I asked myself how I could incorporate numbers in a whimsical way. My Muse answered with several images from a Flickr photo sharing group: The little girl - Takeabreak; the report card image - Sassyarts; and the ruler - HaDesigns. 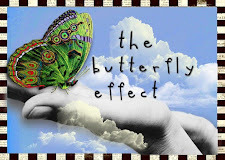 The butterflies and wings are from Dover Publications. A photo editing program was used to size each of the images. They were carefully cut out and glued to a recycled chipboard base before being hand colored with Prismacolor pencils, watercolors, Twinkling H2O's and pan pastels. Shadows were added with a gray Prismacolor pencil and a smudged charcoal pencil. The "a,b,c" was stamped with dark brown Stazon ink. Distress ink was used to age the report card, and the entire piece was edged with a copper-colored marker. Although this piece is a little different from my usual repertoire, I enjoyed creating something a tad more whimsical! I can't believe that it's Memorial Day weekend, and that the beginning of the summer "season" is here! Where did the time go? It seems like it was yesterday when we were wearing parkas and shoveling the white stuff out of our driveways. Hooray for summer! Have fun using these pics from the Library of Congress in your personal artwork! When I collaged the piece, I purposely obscured a portion of my Dad's face to honor all of the GI's who served during that timeframe. 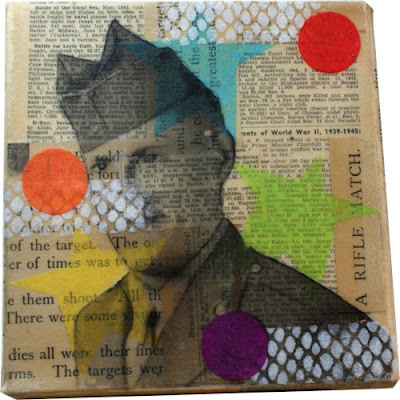 The gel medium transfer was placed over historic data from The War, an old world atlas and other vintage ephemera, along with tissue paper stars and circles. I usually don't wear my patriot's heart on my sleeve, but this is the weekend to show my red, white and blue colors. Memorial Day was originally proclaimed to honor the heroic men and women who sacrificed their lives giving service to our great country. Please take a moment to offer a small prayer of remembrance and gratitude in their memory, and offer a prayer for all of the men and women who serve proudly today. Thanks! May your weekend be filled with sunshine and smiles! While doing some research, I stumbled upon a few pictures that I thought were very interesting from a historic, technological point of view. OMG! 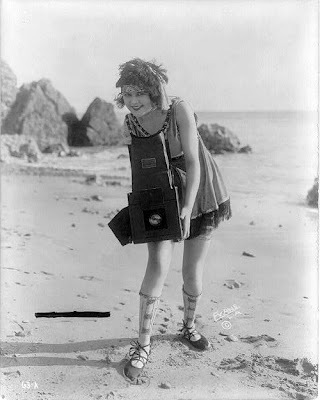 As if those socks weren't quite enough for beach wear, can you even begin to imagine having to tote around a camera this large?!?! My little digital point and shoot is so small, I can barely find it in my purse! 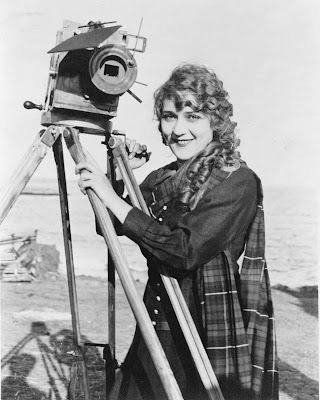 The next shot of Mary Pickford is for the devotees of the little flip video cameras. Look at the size of the tripod on this camera! We've come a long way, Baby! Please feel free to use these pictures in your art. They're both from the Library of Congress - a wonderful place to investigate when you have the time. It's official! I've been tagged by Janine and must list six unimportant things that make me happy. Officially, I'm supposed to tag six more people. However, because I'm a bit unconventional, I'll just do the list part. Here's the twist: If you'd like to make a "Happy List", leave a comment below with a link to your blog. Could be v-e-r-y interesting! And if you have a chance, check out Janine's colorful style here. Babies' "bums" and their laughter. Geeze, I wish I could bottle and sell it! Being curled up in front the fireplace, sitting on the sofa with a good book and a hot cup of tea on a gray, rainy day. And/or . . . Watching the snow come down like crazy, but knowing that everyone's safe and snug inside. The way the light dances and reflects on water (eg. a lake, the ocean). I could watch it shift all day! The smell of home baked anything. Reminds me of my childhood and my beloved Grandma. Researching and learning new things. Smiles! I love to give and get them!!! 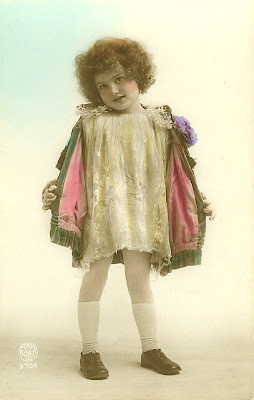 Poor Carmelita (I just love that name!) has been forced to dance her way through life in a Buenos Aires dancehall, and dreams of a better life away from the city lights and party atmosphere. 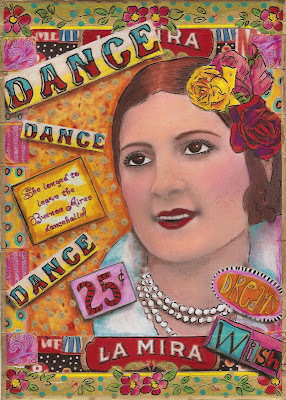 "Carmelita" is a page that was created from this week's Crowabout collage images. All of the images on this piece are from Crowabout (past and present challenges), except for the roses (Dover Publications). The background of this piece was created by enlarging one of the images in a photo editing program and printing it out. Orange acrylic ink was mixed with water in a spray bottle (about 30 drops to 1 ounce of H2O) and then lightly misted over the image twice - allowing for drying in between sprayings. Additional materials: Prismacolor pencils, watercolors, pan pastels, Pitt pens, gold marker and charcoal pencils. A photo editing program was used to size several images. Everything has been hand cut, hand colored and glued to a piece of recycled chipboard from a cereal box. Since my old purple background was beginning to feel very claustrophobic to me, I felt it was time for a change. After all . . . women are known for changing their minds! Hope you like the new look. "Minnie" is a bejeweled Victorian mermaid doll "covered and smothered" (as my friend, Shelly, would say) with ocean-related eye candy. Look closely (right click on the pic) and you'll see multi-colored fish, coral and a few sailing ships. My mermaid was created for a swap. If you'd like to make a mermaid too, you can find the template at Altered Bits. "Minnie" was created from 140 lb. watercolor paper. Her lovely face and hat are from a Flickr photo sharing group - special thanks to TakeABreak. 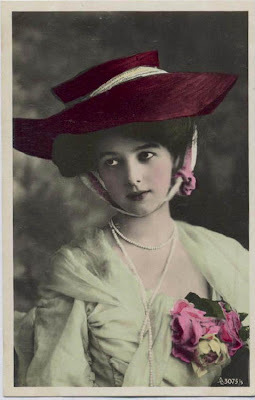 Her adornments (all from Dover Publications) were cropped and sized in a photo editing program. All of the pieces, including the tiny ones, were hand cut and glued to Minnie's scrap paper body, and hand colored with Prismacolors, watercolors and pan pastels. 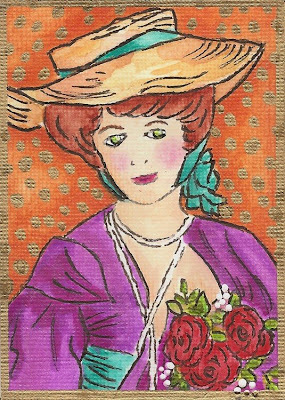 Her embellishments include the purple feathers in her hat, rhinestones and a hand-beaded necklace strung on thin gauge copper wire. A piece of patterned scrapbook paper was attached to the back to finish her nicely. Happy Mother's Day to everyone! As a small gift, please enjoy this freebie (from a Flickr photo sharing group). Use it to create something wonderful! To save the image, double click on the picture and it will open in a larger window. You may then save it to your hard drive. I hope you have a wonderful, relaxing weekend that's full of joy, hugs and smiles! Mother's Day Hugs & Blessings! 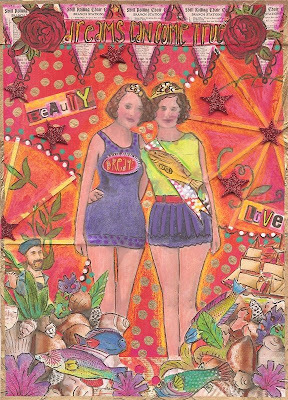 "Miss Fish" and her lovely friend, "The Runner Up", conjures up pleasant memories of silly summer contests and fun. Creating with this week's Crowabout images proved to be somewhat of a challenge. I really wanted to use all of the images; however, this piece incorporates four. The remainder of the images are from Dover Publications, previous Crowabout challenges and a FLICKR photo sharing group. Some of the images (eg. 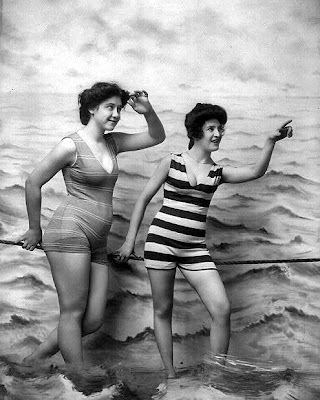 "Miss Fish" and "Runner Up") were sized in a photo editing program. Materials used on this piece were watercolors, Twinkling H2O's, Prismacolor pencils, watercolor crayons, pan pastels and Pitt pens. Additional embellishments include foam "glitter" stars and parasols from the party store. 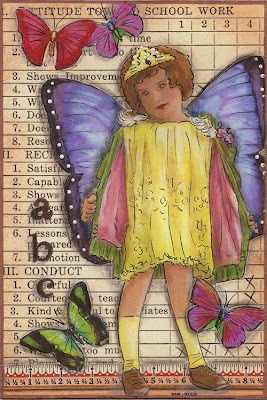 A gold marker was used to outline the page and add a bit of glam to the background. 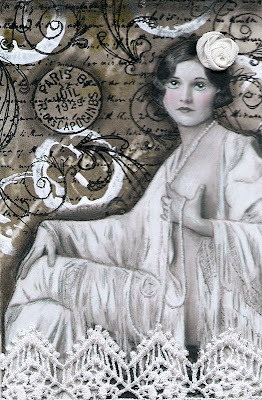 "Evening in Paris" was created for Sunday Postcard Art's black and white challenge and a private swap to create a postcard with at least three circles. Although this piece "scanned" with a bit of a sepia cast, it truly is almost all black and white. Creating in black and white was a challenge within itself for me. It took a bit of courage to step outside of my colorful and lively style. This is quite a departure from my work. The background was created with a piece of Somerset artists' paper. 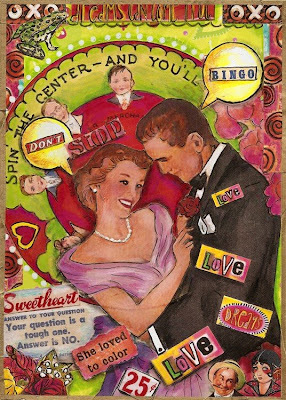 A text stamp was added before gesso circles were applied, followed by some swirly stamps and the Parisian postage stamp. Finally, the ribbon rose was added to her hair and a scrap of lace (edged with teeny-tiny circles) completes the bottom. There's an old saying that my family has heard me use from time to time: "When you least expect it . . . Expect It!" 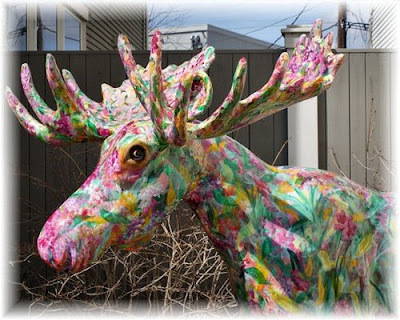 That's exactly what happened when we discovered this colorful moose sculpture on a recent trip to Bennington, Vermont. There we were, driving slowly through downtown Bennington, when we rounded a corner and "BAM!" There he was - standing quietly in someone's yard - in all of his artful glory! My poor husband thought I'd permanently lost it when I started to yell: "Pull over! Pull over!" 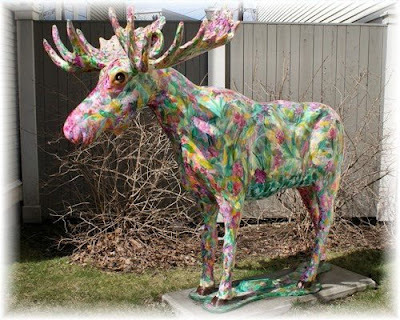 It was love at the first sight of colorful "Mr. Moose", and I had to capture his glorious essence and the wonder of it all! If I may ask, how often do you see a "Magic Moose"?!?! See . . . Expect the unexpected! May YOUR weekend be filled with unexpected pleasures and artful wonders!